I cautioned in last week’s column about the dangers of expecting Crawley Town to repeat their exploits against Newport County with another big win against Exeter City. I was half right as although they turned in another superb performance, the right result was not forthcoming. But that was nothing compared to the hammering they suffered against Tranmere Rovers at Prenton Park. As with their trip to Colchester United, Reds faced opponents against whom they needed to be at their best. In the event they fell well below their own recent standards and paid the penalty. Surprisingly weakness in the air was significant in Rovers’ first three goals, although the usual problem of not marking close enough remains unimproved. Tranmere’s hotshot striker James Norwood had outscored Ollie Palmer and he did it again in this fixture, collecting a brace. Palmer’s ninth goal of his topscoring season spurred him on, but until his late consolation, Crawley’s only scoring threat seemed to come from irrepressible captain Filipe Morais. 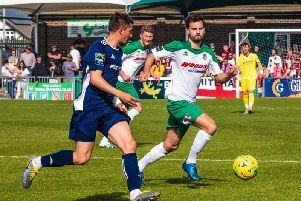 The vast gulf between Reds’ form and results home and away is puzzling as Gabriele Cioffi always endeavours when on the road to get his side playing with the same attacking panache that they show at Broadfield Stadium. They just don’t seem able to find that up and at ‘em rhythm when they travel. If it is not corrected their playing record will inevitably maroon them in midtable when we all know they are quite capable of pushing for the play-offs. Gaby and coach Nathan Rooney need to put on their thinking caps. Whilst the result on Merseyside was what the lads deserved, against Exeter in midweek I thought they were short-changed for their efforts. The Reds played some excellent football at times, showing great pace and precision with their passing. They out ran and out-passed the high flying visitors which left the Grecians with only one form of defence. They didn’t exactly park the bus, but often they were forced to employ all ten outfield players in defence although Reds didn’t quite have the nous to penetrate a very crowded penalty area. It took them an hour of probing before the deadlock was broken by Morais who enjoyed another brilliant outing and he was well supported in attack by Josh Payne. The congestion in the box was evidenced by Palmer failing to muster a single goal attempt, despite some very hard work. Reds were undone by a single error when they lost possession on the edge of the Exeter box and from 90 yards Dean Moxey released Lee Holmes who sprinted away to slot the equaliser in a perfect example of how to counter attack. I reckoned Reds deserved at least two points, if not all three, but they only got the one and that was courtesy of a late goalline clearance by Romain Vincelot.